In wake of terror attacks across Europe, security establishment predicting terrorists will target Jews during upcoming Pesach holiday. Security agencies around the world are ramping up operations at airports and tourist sites ahead of the c holiday. 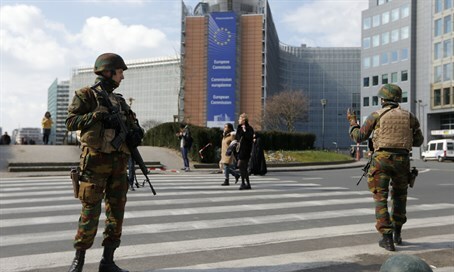 With the security establishment predicting a wave of terror attacks against Jewish targets during the holiday season, officials in Israel and Europe are taking precautions to prevent the kinds of massacres that took place in Brussels and Paris. Security officials also voiced concern over Chabad Houses and other Jewish targets in Asia, warning that isolated Jewish communities or facilities were especially vulnerable. In 2008 Islamic terrorists struck the Mumbai Chabad House, killing six. Chabad Houses and other isolated Jewish centers have been advised on security protocols and in some cases have been provided direct assistance. Israeli security officials have been working in close conjunction in recent weeks with their European counterparts, visiting with local authorities and assessing security at airports and other high-risk targets. Among the high-level meetings with European defense officials, Israeli Defense Minister Moshe Ya’alon met Wednesday night with Poland’s Defense Minister during the latter’s visit to Israel. The two discussed the security situation after last month’s Brussels bombings and the rise of ISIS in Europe. Ya’alon noted that Europe was inundated with hundreds of ISIS terrorists, and that the terror organization would continue attempts to commit mass casualty attacks on European soil. The attacks in Paris and Brussels, the Israeli Defense Minister remarked, were only the beginning of the ISIS terror wave in Europe.